All four Mayoral candidates will participate in the Cairns City Forum tomorrow, Sunday afternoon at City Place. Mayor Val Schier, along with Deputy Mayor Margaret Cochrane, Ian Thomas and Bob Manning, have all agreed to participating in the public debate. Organisers are hoping for a good turnout from the community. “It’s great that people are becoming more interested in local issues and putting more thought into who they vote for," event organiser Angus Gasson said. "It’s also great that candidates are making themselves more available so people can ask them questions directly." The Toastmasters Cairns City Forum begins with a live music performance by Johannes Selhofer at 12.30pm, in City Place. All mayoral candidates offer distinctly different styles, each telling us why we should vote for them. There is also a wide variety of council candidates in Sue Bertuch and Zac Murphy, Locco and Richie Bates; Annette Sheppard and Jenny Glaze; Ross Parisi and Tim O'Hallahan; Max O'Halloran, Di Forsyth and Steve Grasso, Rob Pyne and Nick Thompson, and many more. 12.45pm Performance by classical guitarist Johannes Selhofer. The Cairns City Forum is being held in City Place, our "town square", is significant, says Geoff Holland, an organiser of the public political forums and Greens candidate in the State election. "The town square is historically linked to democracy, from the Agora in Athens, designed to foster democracy," says Geoff Holland. "The Cairns City Council paid lip service to this historical tradition when it provided a Speaker's Corner and tiled Podium and plaque - detailing guidelines for using this instrument of free speech - during the failed renovations in 2000." "Our public spaces are being privatised with every new shopping mall. Another is now being planned for Spence Street without any community engagement and our Council to challenge the Development Application for fear of being sued. 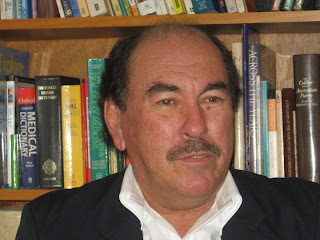 Privatisation of public meeting places means restriction of democratic free speech." Holland says that that the opening of City Place to traffic is a move with a 15-year history led by the Cairns Chamber of Commerce, a former Mayor, and certain politicians who advocate for the Corporate Sector. "It has been suggested that there has always been a 3-stage strategy beginning with degrading City Place - makeover in 2000 when shade trees, fountain, grassy knoll and convivial seating were removed under the pretext of 'improving' City Place but actually creating a hostile environment," Geoff Holland said. "The second stage is to open City Place to buses - moving slowly through. When it is demonstrated - manufacturing consent via the Corporate-owned media - how successful this has been, the third phase of opening to cars will be introduced." 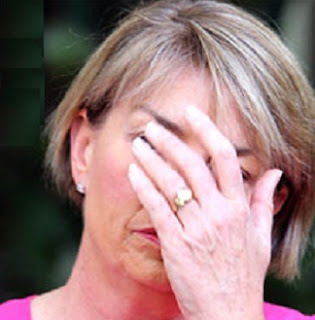 Many agree Anna Bligh’s relentless self-styled negative attacks on Campbell Newman, followed by a capitulating plea bargain for votes, was one of the more pitiful political performances in recent times. When the damage was done, Bligh finally took the blame for this record loss with an ear-to-ear grin. Little did many of the party faithful know she had already planned her exit from State politics without even bothering to serve any of her new term out. Is this the same sort of cut and run that Labor tried to tag and punish Newman with after leaving the Brisbane mayoralty? 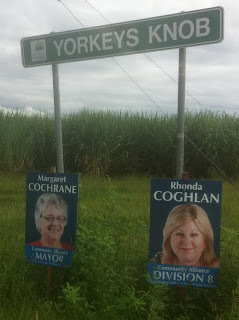 At a local level in Cairns, the hypocrisy continued. Councilor Kirsten Lesina was “pre-selected” and was personally backed by Premier Bligh, despite having to leave her inaugural council term prematurely to campaign for the State. Sound familiar? Lesina fitted the mold for Labor; compliant, smiling, obedient, and prepared to join any faction that would give her the seat. Such was the deal; she didn’t even bother to face the party leaders for the “Super Thursday” electoral college speech. The other Labor opponent up for selection for the seat of Cairns, Railway Union Delegate Richie Bates, made the trip to Brisbane in a borrowed suit to give his address. Bligh chuckled at the one-liner Bates used as an opening and then promptly gave her vote to the absent Lesina, despite Bligh being in the same faction as Bates. Although Bates won the local ballot back in Cairns, this deed from the Premier was enough to give the young career politician Lesina the nod. Bates, a candidate for Cairns Regional council in 2008, and again this year, had thrown his hat in the State ring to make sure the party faithful had a choice. It was a noble but naïve act as the die was already cast. A vocal opponent of the Labor governments unpopular asset sales, Bates along with the ETU firebrand Stuart Trail had put principle and party policy first and criticized Bligh’s program of selling off Queensland’s highly profitable coal freight business. Bates held his nerve and didn’t complain. The party owed him nothing and this was politics after all. While his recent move to the former Kevin Byrne-run Unity team for Cairns Council elections might come as shock to many, Bates claims his traditional Labor and union principles are as strong as ever. Clearly, it’s a risky move for Unity's leader Bob Manning to take on the dogmatic Bates, but with Val Schier unable to gain any support to form a team, perhaps this is the moment where unlikely partnerships will prosper and prevail. And now with former Labor members and candidates running a mile from the Labor "brand", the irony is Bates is still one of the few with his heart on his sleeve. While the crushing defeat of Labor is the big news in the State election, there’s another story with the local collapse of The Greens vote, writes Bryan Law. 38% of voters who chose Greens in Mulgrave in 2009, abandoned the Party on Saturday. 34% abandoned them in Cairns, 27% in Barron River and 19% in Cook. The State average decline was 9.5%. The State election was historic, but the change in support for The Greens in FNQ hasn't gone unnoticed. In the key seats for which the FNQ Greens branch is responsible the Party suffered losses 3-4 times as great as the state average. 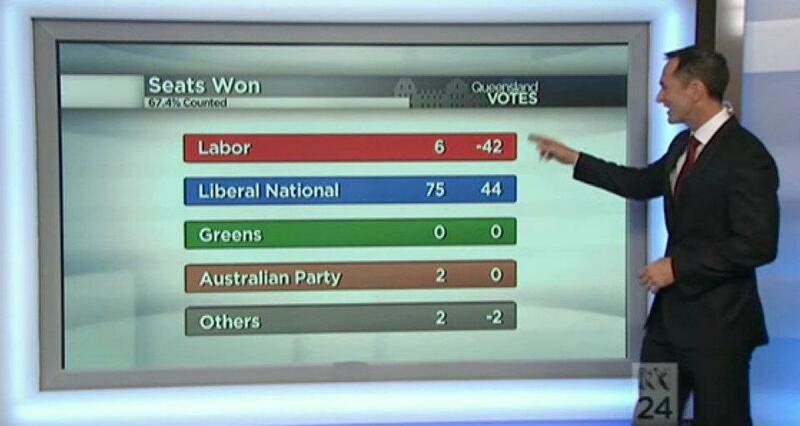 Proportionally the FNQ Greens performed worse than Labor. Why? The FNQ branch of The Greens has been virulently anti-democratic for a decade. Meetings are conducted unconstitutionally. Members are excluded. Office-holders are prevented (literally by an old boys network) from actually running the branch, and the Party has no campaign presence between one election and the next. So in 2012, the election we all waited months to be called, The Greens were scrambling to find candidates. In the week before nominations closed with the Electoral Commission, FNQ Greens were talking about using “paper” candidates - people who live outside the area, don’t campaign locally, and just fill a space on the ballot paper. Fortunately a few locals put their hands up, but these were people with jobs and family commitments that left them unable to campaign effectively. 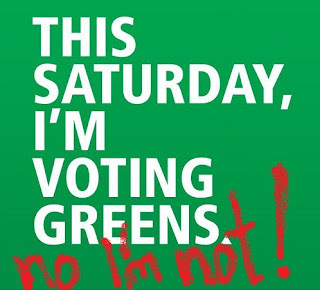 FNQ Greens have no campaign strategy, no personnel, not even voluntary campaign managers, no plan, and very few points of connection with voter interests. At the media launch of The Greens campaign, Senator Larissa Waters was the key speaker, and took the lion’s share of time. When the question of preferences came up, Senator Waters said that was the business of the Greens’ State Council, which had decided “as a matter of principle not to recommend preferences, although that may vary in particular seats." Senator Waters then prevented Barron River candidate Elaine Harding from answering questions about preferences. Sure enough, the apparatchiks in Brisbane did try to allocate preferences to Kate Jones in Ashgrove. An act of stupidity and bastardry that was quickly known around the State. The rationale this time was that Labor would, in return for preferences at Ashgrove, allocate preferences to the Greens in Mt Coot-tha, where the star Greens candidate, Adam Stone, was running. In 2009 a similar preference deal was done to support Ronan Lee in Indooroopilly. The strategy failed in 2012, just as it had in 2009 – and this time it damaged the Greens vote state-wide. In fact the Greens lost 12.8% of its former voters in Mt Coot-tha, was unable to put its nose in front of either major party, and preferences for them were never counted. Just like Indooroopilly in 2009. Once upon a time, the Greens were a big hope for political innovation around the world (which last time I looked includes Queensland). They promised to be open, transparent, accountable, activist, inclusive, and follow the precepts of nonviolence. The FNQ branch of The Greens have abandoned every single one of those objectives, and now voters are abandoning them. Jon Metcalf, take a bow. Cairns Regional Council will lodge the Development Application for the Cairns Entertainment Precinct with Ports North this week. The 1500-page application covers the construction of the precinct in full detail. Council says this is the first key milestone of the Commonwealth Funding Agreement and the first substantial payment. The dramatic and crushing defeat of Labor was one thing, but less than 12 hours after the election result was counted, former Premier Anna Bligh's resignation smacks of enormous arrogance and disdain for the democratic process. The by-election that will now be called for Bligh's South Brisbane seat, following her shock resignation the day after Saturday's poll, will cost at least half a million dollars. It's likely that this is another first in Australian political history, where a re-elected MP resigns within hours after the election result. Anna Bligh said throughout the month-long campaign, if re-elected she would serve the full term. "It's time to close the book on public life after leading Queensland Labor to such a devastating loss," Bligh said. "I apologise today to the people of South Brisbane for any inconvenience and difficulty that my decision will cause them." The way the Wivenhoe Dam was fatally mis-managed in the lead up to the floods of 2011; the dirt and false smear campaigning, and a bank balance steering down the barrel at $70 billion debt, are just some of the reasons the public gave up on Labor and Anna Bligh. "Her resignation comes three years too late for Queensland Labor," expelled Labor member and Labor Electrical Trades Union secretary, Peter Simpson says. Simpson, who, along with Cairns ETU organiser Stuey Traill, was highly critical of Labor's asset sale programme, said the Party would not have had such a devastating loss in the State election if Bligh had resigned a year ago. Barron River's dumped Labor MP Steve Wettenhall, was one of many that promised there would be no asset sales during the 2009 election, but proceeded in a fire sale after winning office. Whilst many will appreciate the emotional trauma Bligh and Queensland Labor will be going through, her decision to resign from Parliament and the party leaderships, appears an emotional response more than anything else. Bligh will not be marching off to CentreLink anytime soon, with a massive $150,000-a-year pension for life, and her husband Greg Withers may be the recipient of more than half a million dollars, if his role at the Office of Climate Change is terminated. Labor's performance will not only influence voters at the April 28th Council poll, but will be a death knell for Federal Labor. Political swings of 17% are so rare in modern western democracies, and there is a lot to analyse why so many loyal party faithful had got fed up and decided they too wanted a change. The coconut palm trees removal from Four Mile Beach, Port Douglas, will also be before this meeting, which will be held at 11am. Former Mulgrave Shire Councillor and Barron Delta farmer, Ross Parisi, will contest the Cairns Regional Council election, at the end of April. Parisi, who when elected in elected 1976 at 23 years of age, was the youngest elected in Cairns at the time. Former Councillor Kirsten Lesina broke the record in 2008 when she was elected at 21. Paris will contest the Division 9 seat, held by Sno Bonneau, who has said he will not run again. Bonneau was subject to a year-long investigation in campaign donations and accused of not declaring conflicts before voting. "I continue to hold a passion for the betterment of our community and I will endeavour to achieve positive change," Parisi says. "As an inquisitive human being, I am on a journey of exploration and expansion of my knowledge." "I will not be representing any party," Parisi told CairnsBlog. Parisi has recently returned to James Cook University and is studying law, politics and history. He is also a Justice of the Peace and a Commissioner for Declarations. Former Mulgrave Shire councillor and local Barron River farmer Ross Parisi, said Bonneau and Blake should stand down. "[They] should stand down from any official position and not participate in any Cairns Regional Council duty while they are under investigation for possible breach of conduct," Ross Parisi told CairnsBlog at the time. "Any elected position is one of trust and for that trust to be compromised is not acceptable under our Westminster system of democracy and public accountability." Parisi has also been very critical of the way former Ccuncillor Sno Bonneau acted in relation to campaign donations, a charge taken to the CEO by Councillor Rob Pyne, and cleared just three weeks ago, 24 hours after announcing his retirement. "The allegations that the councillor may have accepted undeclared donations from developers and may have voted in development applications are serious matters and go to the core in public probity," Ross Parisi said. "One of the major tenet in our parliamentary government democracy is that all citizens are subject to the law and that justice needs to be done but also is seen to be done." 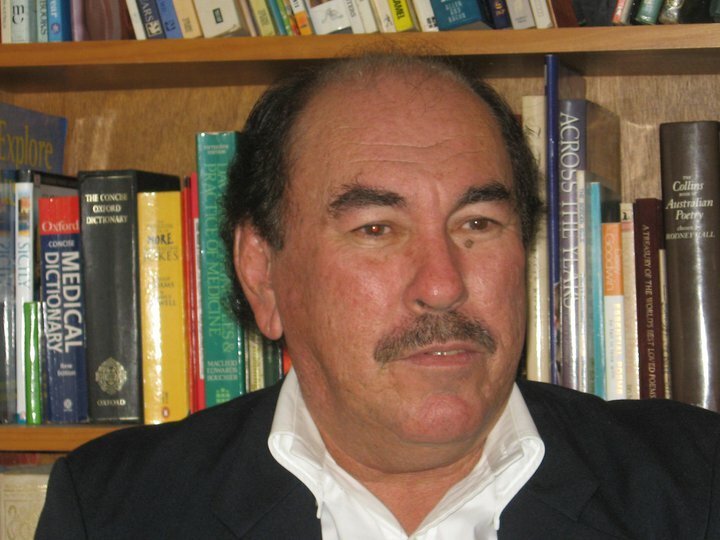 "The Councillors [Bonneau and Blake] should be given the opportunity to stand aside with dignity and falling that the Cairns Regional Council's CEO should demand that they stand down without pay and refrain from any Council engagement while the allegations are investigated by the Regional Conduct Review Panel," Parisi said at the time. "Once I read the Review Panel's report, there are still many serious questions to be answered," Parisi told CairnsBlog. There's no doubt that with a swing of close to 16%, and Labor not even having enough MPs to form a cricket team, this is probably the most dramatic political change for Queensland since Federation. Curtailing the spiraling $70 billion debt and genuinely addressing our employment situation, has to be the priority for this new government. Congrats to our new MPs. Michael Trout for Barron River, Gavin King in Cairns and David Kempton for Cook. It looks as though Curtis Pitt will retain Mulgrave with a small majority, and will likely become the new leader of Queensland Labor. My thoughts go out to Steve Wettenhall, Kirsten Lesina and Jason O'Brien, their staff and families. - Low lying streets around Edmonton including Shaft and Farmer Streets. The substantial overnight rainfall has also caused power cuts on the Northern Beaches and other suburbs, that are still to be repaired this morning. Katter's Australian Party candidate for Cairns, Darren Hunt, has welcomed the move by the Cairns LNP to ignore their official party position on preferences with Katter’s Australia Party. “It is a bit rich of the Cairns LNP to tell voters at the polls that they are exchanging preferences with us, when their candidate continues to tell the public they will not get involved with minor parties or the ‘Mad Katters’. They need to be honest with the electorate." Darren Hunt says that if Gavin King wanted a preference deal with Katter's Australian Party, he should just :have the courage to come out publicly and ask" instead of getting his lackeys to do it behind the scenes. "It just highlights the ongoing hypocrisy of this party and this candidate in particular,” Darren Hunt says. “The truth is we do not have a preference arrangement with any one so the LNP should stop misleading voters." An environmentalist was booted out of an LNP business luncheon today in Brisbane. In attendance were John Howard and Campbell Newman. 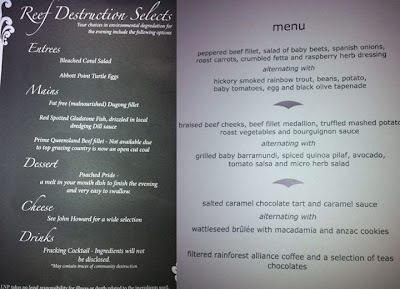 These fake menus were distributed on the tables.... the correct menu is on the right. Thanks to the folk at the Brisbane Times. The Australian Christian Lobby is inviting all candidates for the seats of Mulgrave, Cairns, and Barron River to present their election platforms, in the run up to the State election. There will be two Meet Your Candidates forums. The first Forum will be held at the Cairns Baptist Church, 138 Lake Street at 6:45pm, Tuesday 13th March, for the seats of Mulgrave and Cairns. Wendy Francis, head of the ACL, will attend Tuesday's forum. The second forum will be held at the Generations Church, 1 Moore Road, Kewarra Beach at 6:45pm, March 20th. This is for candidates for the seat of Barron River. ''This is an opportunity to show politicians and candidates seeking election that you care about how Australia is governed,'' Wendy Francis says. The ACL says that the forums are run on a non-party partisan basis and encourages people to view it's information from a Christian perspective, on their special election website. Labor's Civil Partnerships law, opposed and threatened with repeal by the LNP, and Bob Katter believes is the path to polygamy, comes into law today. Today the State of Queensland joins with most western countries in welcoming in civil unions for all couples.